KIEV, Ukraine -- International aid agencies say about 1.4 million people have fled the fighting in eastern Ukraine and moved elsewhere in the country. Irina Kipina fears she and her daughters will be driven out by the owners of the building they are living in. Social workers speak of a "hidden" humanitarian crisis, since many of these people are not concentrated visibly in refugee camps, but are tucked away in apartments, dormitories and sanatoriums on the outskirts of towns and cities. These "internally displaced people" (IDPs) - the official name for refugees who do not cross international borders - struggle to find permanent housing and regular jobs in Ukraine's moribund economy, often lacking the necessary work and residence documents. Their situation is all the more precarious because it is concealed. Less than 5% live in officially-recognised facilities, officials say. Observers warn that their circumstances will become much worse when winter comes, since many live in sub-standard housing. 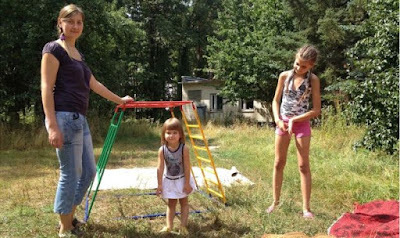 Irina Kipina left Kramatorsk in eastern Ukraine and now lives in a single room with her two small daughters in a rundown holiday camp in the village of Vorzel, outside the capital Kiev. Irina says she cannot afford a regular apartment. So she and her daughters spend their days in a half-empty building among a handful of other IDPs, travelling sometimes to the local market, or taking walks along paths overgrown with weeds. "We live like on a powder keg. That is, unofficially," she says. "This isn't our home. The owners can come any moment and say, 'Why are you still here? Go home.'" According to Irina, the owners of the buildings are trying to drive the IDPs out, by sometimes turning off the electricity. She sees her husband infrequently. He has found work in a string of temporary jobs on construction sites in Kiev, and because of the commute, which can take up to three hours, he lives in a dormitory in the capital. "There are jobs - just not officially," she says. "Today's there's work, tomorrow there's nothing. As soon as one job's finished, you have to search for the next. There's no stable employment." Irina gets by thanks to outside help. International organisations such as the United Nations High Commission for Refugees (UNHCR) have provided some $23m in aid - but say they need almost $18m more to cover all their needs. In Ukraine, however, the lion's share of the assistance on the ground comes from local volunteer organisations. One of these, "Kozhen Mozhe," or "Everyone Is Able," helps Irina and the other IDPs at the holiday camp. The group's coordinator, Oksana Lazebnik, says that she is involved in every aspect of the IDPs' lives, from finding housing, to assisting with medical care and clothing. Irina for example has a tumour in her eye that doctors will soon examine to determine whether it is malignant. Oksana says that she and fellow volunteers have adapted to a lack of support from the Ukrainian government. Kiev has yet to introduce a comprehensive plan to deal with the refugees, who receive on average about $20 per month - and only for a limited period of time. "Unfortunately, everyone knows that we can't expect any kind of help from the government," says Oksana. "Everything has been placed on the volunteers' shoulders." Not everyone who has fled the fighting in eastern Ukraine is struggling, however. Many of these are young professionals for whom relocating to an unknown labour market is not as much of a problem. 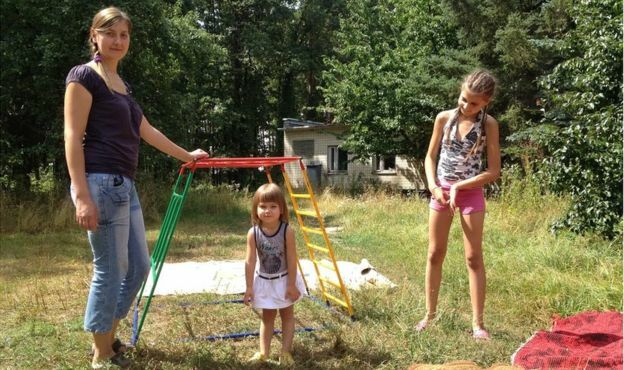 Yevgeniy and Yulia Vasili moved their bar, "Spletni" (Gossip), lock, stock and barrel from their home in Donetsk to central Kiev at the end of last year. "Everything here is from Donetsk - the chairs, tables, even the paintings and glasses," Yevgeniy says, every inch the Western-style hipster, with his baseball cap, full beard and tattooed forearms. Even much of the clientele comes from Donetsk; they pack the bar on a recent Friday night, sipping cocktails and smoking water pipes. "It's young people here, people from 22 to maybe 40," Yevgeniy says. "It's students, managers, hipsters sometimes - it's progressive youth." Of course, the success of Yevgeniy and Yulia's business is not a given. Yevgeniy says there are around 1,000 bars in Kiev. But he says his family, which includes an infant son, has left eastern Ukraine for the long run, and he hopes his parents can join them. "Maybe soon they will move, because it's a terrible time there now," he says. 'War hasn't ended' Irina, however, is contemplating returning to Kramatorsk. "We'll stay here until the cold sets in. Another two months here then we'll need to leave," she says. But her plans are not certain. Right now the situation in Kramatorsk is relatively quiet. But if fighting erupts again, she and her family will stay away. "The war hasn't ended," she says. "And if the separatists get it into their heads, then they'll return."